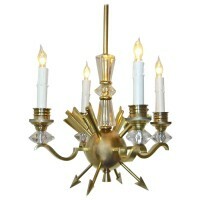 French four-arm Directoire style brass chandelier with arrow motif and crystal accents in the manner of Jules Leleu. Chandelier uses 4-40 watt max candelabra base bulbs, newly wired. Fixture 15″ diameter by 15″ tall, overall height with center rod and ceiling cap 31″, can be adjusted to suit.